A New Tool: Astro-Physics Refractor! 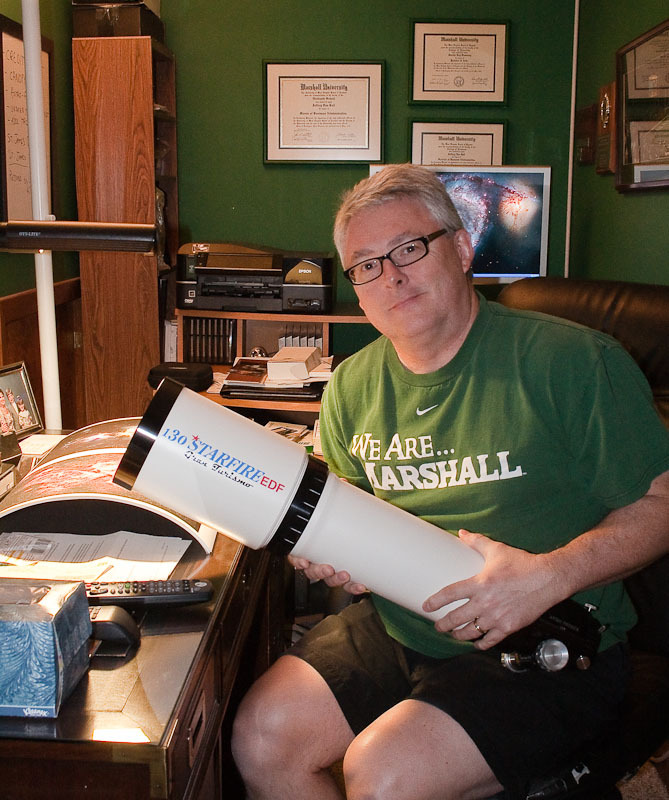 The Astro-Physics 130EDF refractorToday I received an Astro-Physics 130EDF refractor. Astro-Physics is a premier telescope manufacturer and IMHO manufacture the best photographic instruments available today. The refractor is an f6 focal ratio and a focal length of over 800mm. The telescope can be stopped down to f4 and about 600mm focal length. This telescope has a field of view at 600mm of 2x3 degrees. It will be terrific for moderate field objects like the Andromeda Galaxy, Pleiades, Triangulum Galaxy, and the Rosette. Can't wait to put the instrument to work. Viewfinder Standard iPhone AppIt may not always be convenient to have your camera and lens ready for judging a composition that presents itself in the field. For those of us who utilized 4x5 or larger format cameras, we worked a bit slower in the field and utilized compositional aids to be more efficient. I utilized a card board cut out in a 4x5 format and would hold the visualizer at varying distances from my eye to simulate various focal length lenses. I also utilized a Linhoff visualizer tool with varying focal distances represented. These tools saved me from having to take out and setup the camera gear every time I thought I had a composition. Well now iPhone users have a very nice new tool to aid in visualization while in the field. I normally have my iPhone on me so it is pretty convenient for me to access the camera, certainly more convenient than taking the camera out of the backpack every time I want to evaluate a composition. And perhaps I am at a location without my camera gear? Now I can use the iPhone app to capture the image and the desired focal length lens for a potential return visit with the gear. The app is called Viewfinder and comes in two formats, Standard or Pro. The main difference is that the Pro version has pre-configured formats for medium format cameras and digital backs. If you use a 35mm DSLR then the Standard is probably all you need. The Standard version is $7.99 and the Pro is $14.99. As you can see in the image above, the app shows an overlay grid for varying focal lengths while you are viewing the live image on the screen. You can click on one of the focal lengths to isolate that focal length exclusively in the view while the others are grayed out. Setup is quite simple where you select the camera body you will be using and the focal lengths of lenses you want to have represented in the overlay. 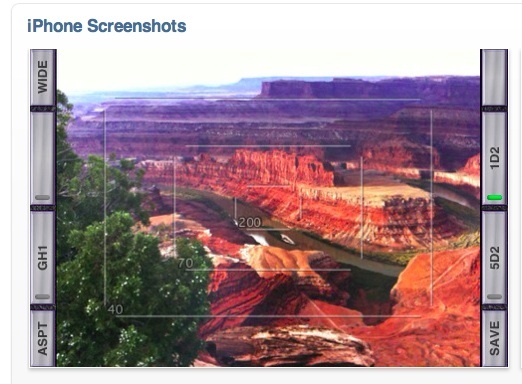 You can also set the app to display a 16:9 format to aid in compositions for video capture. The first being that the widest angle the iPhone can represent is 35mm equivalent of a 35mm DSLR camera. Evidently there are some adapters you can attach to the iPhone camera to give a wider angle lens, but few utilize this and it seems to take away from the convenience of the device. So knowing that you really can't visualize via the Viewfinder app any lens below 35mm is necessary in evaluating its effectiveness for you. I don't find this a limitation at all since most wide angle compositions are pretty obvious and I need more assistance with longer telephoto compositions that isolate landscape rather than encompass landscape. The iPhone screen can be challenging to view in very bright daylight. Now most of the time this isn't the best light to be photographing in any way, but you may be photographing in sunset light with the sun at your back and that may be challenging to view the screen. Most of the time the viewing conditions will be fine for viewing the iPhone screen. The Viewfinder visualizer looks like a wonderful new tool for photographers. I expect to utilize it quite a bit in the field and hope to give it a hard workout on the upcoming field visit to the Great Smoky Mountains. So far this is an early recommendation for the app. Please let me know if you have any thoughts or ideas on the app. The Great Nebula in OrionI continue to be amazed at the newest Digital SLR technology. My friend and astroimaging partner Brent Maynard performed the necessary modifications on one of the latest cameras from Canon, the T1i. You can find a blog post about this modification by clicking on the "equipment" category or going to the post on January 30. The latest crop of DSLR are offering mind-boggling ISO 3200 and 6400 ISOs and so I just had to test the performance of these cameras at that ISO. All of this is driven by the "expose to the right" mantra espoused by Michael Reichmann (look for a future blog on this.) So the modified Canon T1i gathered first light at the Winter Star Party in Febuary 2010. I mainly imaged at ISO 3200 and found the results to be outstanding. 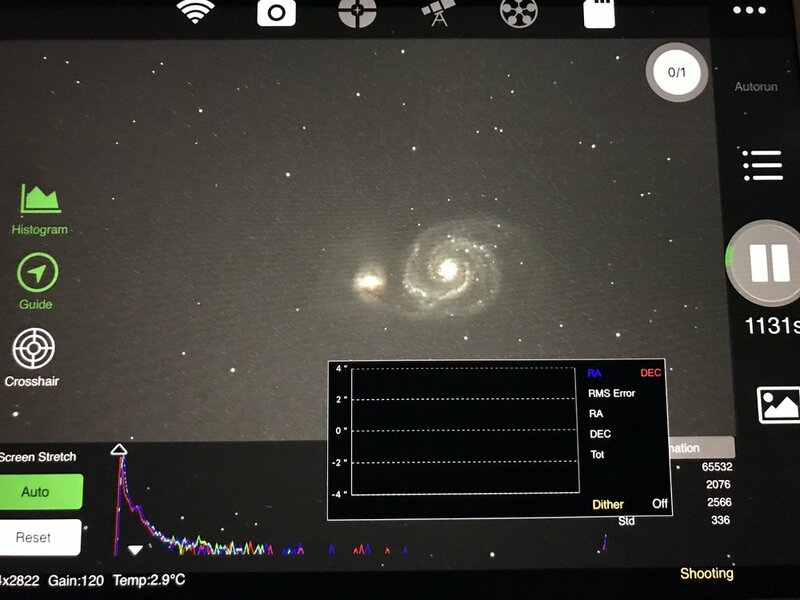 Upon returning home, the previous blog recounts my motivation for trying the new camera in our own Donald C. Martin Observatory. Although now I wanted to give the ISO 6400 a try with a light pollution filter in the camera body to aid in gathering a high quality signal. 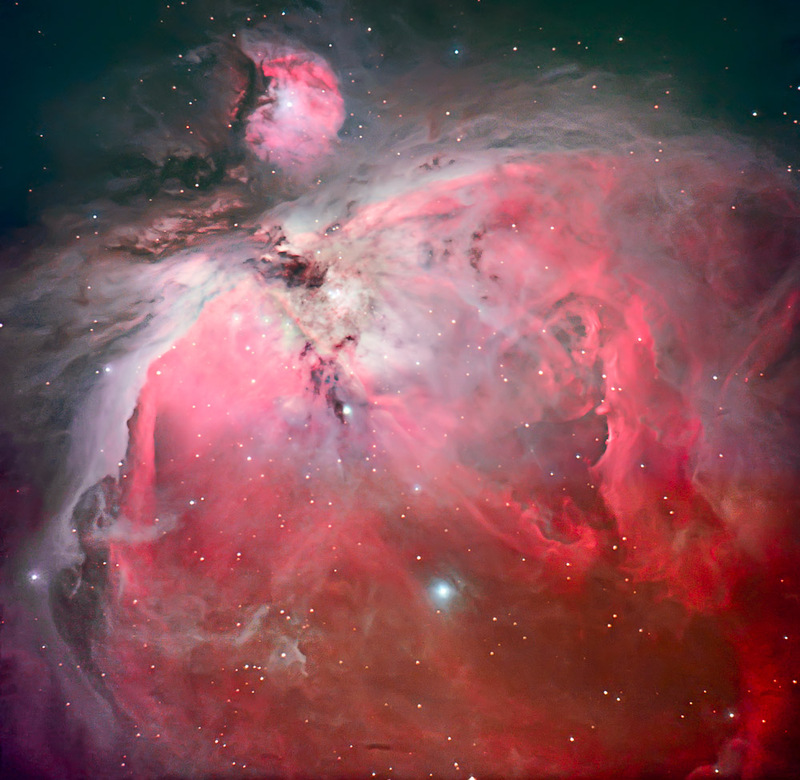 The results are posted today of M42, The Great Nebula in Orion. It was a very nice first experiment with the gear and I can't wait to work on some of the summer Milky Way objects with the C14 scope and AP 1200 mount with the Canon T1I camera. The details of the image are that it is a mosaic of two frames, each with approximately 50 minutes of data comprised of individual 1 minute exposures at ISO 6400. There was a third group of exposures used to capture the dynamic range of the core where exposures where 5 seconds in duration for 1 minute total. All images were processed in Adobe Light Room, the TIFFs were then stacked in Deep Sky Stacker and the combined image was processed in Adobe Photoshop CS4. I hope you enjoy the image and I look forward to capturing more Milky Way objects this summer. Please click on the image to access the color gallery and then click on the Great Orion thumbnail for a larger presentation.